Ketosis is the physiological state where the concentration of ketone bodies in the blood is higher than normal. This is generally agreed to be at beta-hydroxybutyrate (BHB) concentrations greater than 0.5 mM. Ketosis occurs either as a result of increased fat oxidation, whilst fasting or following a strict ketosis diet plan (ENDOGENOUS ketosis), or after consuming a ketone supplement (EXOGENOUS ketosis). When in a state of ketosis the body can use ketones to provide a fuel for cellular respiration instead of its usual substrates: carbohydrate, fat or protein. Normally, the body breaks down carbohydrates, fat, and (sometimes) proteins to provide energy. When carbohydrate is consumed in the diet, some is used immediately to maintain blood glucose levels, and the rest is stored. The hormone that signals to cells to store carbohydrate is insulin. The liver stores carbohydrate as glycogen, this is broken down and released between meals to keep blood glucose levels constant. Muscles also store glycogen, when broken down this provides fuel for exercise. Most cells in the body can switch readily between using carbohydrates and fat as fuel. Fuel used depends on substrate availability, on the energy demands of the cell and other neural and hormonal signals. The brain is different as it is dependent on carbohydrates as a fuel source. This is because fats cannot easily cross the blood-brain barrier. The inability to make use of energy within fat poses a problem during periods where there is limited carbohydrate in the diet. If blood glucose levels fall to low, brain function declines. Relatively little energy is stored as carbohydrate (2,000 kCal) compared to fat (150,000 kCal). The body's store of carbohydrates runs out with a few days of carbohydrate restriction. Once glycogen is depleted, a cascade of hormonal signals causes the body to increase the release of stored fats (from adipose tissue). Signals include the fall in blood insulin, rise in a hormone called glucagon and an increase in cortisol (stress hormone) 1. The increase in blood fatty acids is a key trigger for ketone production (ketogenesis). Unlike fats, ketones are readily used as a fuel in the brain. Fatty acids are converted into ketone bodies in the liver, and ketones can provide up to 60% of the brain's energy requirements during starvation 2. The graph below shows how BHB (black triangles) builds up in the blood over many days until it reaches a level of around 6 mM. Ketone metabolism evolved to convert fat into energy for the brain when carbohydrate (glycogen) levels are low. This adaptation ensured that prehistoric man could survive periods of fasting and carbohydrate deprivation3. What is ketosis useful for now? Some of the benefits of ketosis occur due to the restriction of dietary carbohydrate. Others occur due to the presence of ketones in the blood. Two of the most commonly sought after effects are weight-loss and improved insulin sensitivity. These are conferred by the low carbohydrate content of the diet allowing increased fat burning and the gradual restoration of insulin sensitivity. In this article we discuss the basics of ketone production and metabolism, and some of the many ways that KETONES themselves (endogenous AND exogenous) can benefit health and performance. Ketogenesis is the pathway that forms ketone bodies from fatty acids. Starvation (specifically low levels of blood insulin and glucose) triggers ketogenesis in the liver cells’ mitochondria. Two molecules of acetyl-CoA from the breakdown of fatty acids are condensed via acetyl-CoA transferase to form acetoacetyl-CoA; a third is added to form 3-hydroxy-3-methylglutaryl-CoA (HMG-CoA) in a reaction catalysed by HMG-CoA synthase. HMG-CoA lyase then splits this to re-generate acetyl-CoA and form one molecule of AcAc. Beta-hydroxybutyrate (BHB) is formed from reduction of AcAc by BHB-dehydrogenase enzyme, and acetone results from spontaneous, non-enzymatic decarboxylation of AcAc. Acetone is a volatile molecule which is primarily excreted in the breath, although some evidence suggests that a small amount can be metabolised and oxidised4. BHB is the main circulating ketone body, although acetoacetate is also present in the blood at lower amounts. BHB is taken up by cells through a transporter called the monocarboxylate transporter, which is widely expressed throughout the body 5. Ketolysis is the process of breaking down ketones to ultimately provide energy through the Krebs Cycle and mitochondrial oxidative (using oxygen) phosphorylation. Ketone bodies are broken down in the mitochondria of virtually all tissues in the body. The liver is a notable exception, being unable to utilise ketones as a fuel because liver cells lack acetyl-CoA thiolase, a key enzyme in the ketone oxidative pathway. BHB enters the mitochondria of the cell through a monocarboxylate transporter, undergoes conversion to acetoacetate by BHB dehydrogenase and then addition of a CoA group from succinyl-CoA by 3-oxo-acid transferase. The resulting acetoacetyl-CoA acts a substrate for the formation of two molecules of acetyl-CoA in a reaction catalysed by acetyl-CoA thiolase. Acetyl-CoA is then available to condense with oxaloacetate and enter the Krebs cycle. Our body is driven by a series of controlled chemical reactions, resulting in the oxidation of carbon fuels (such as ketones, carbohydrate and fat) to water and carbon dioxide. The energy from these reactions is stored in a molecule called ATP. In order to best investigate the efficiency of different fuels, one needs a closed system, where the substrate conditions can be changed and the oxygen consumption and work done can be accurately measured. Isolated (ex-vivo) animal hearts are the best model to study these variables, as it is easy to manipulate the fuel provided (i.e glucose, ketones), to measure the oxygen use and also the amount of work (how much fluid is pumped). Heart given fixed glucose (Gl). Heart given fixed glucose and insulin (Gl, I). Heart given fixed glucose and ketones (Gl, K). Heart given fixed glucose, insulin and ketones (Gl, I, K). The results showed that adding insulin (Gl, I) load increased both cardiac output and hydraulic work (although only significant in the case of hydraulic work). Adding ketones (Gl, K) increased both cardiac output and hydraulic work significantly. Combining insulin and ketones with glucose (Gl, I, K) increased neither measure. Oxygen consumption was significantly reduced in (Gl, I) (G, K) and (Gl, I, K) relative to (G). 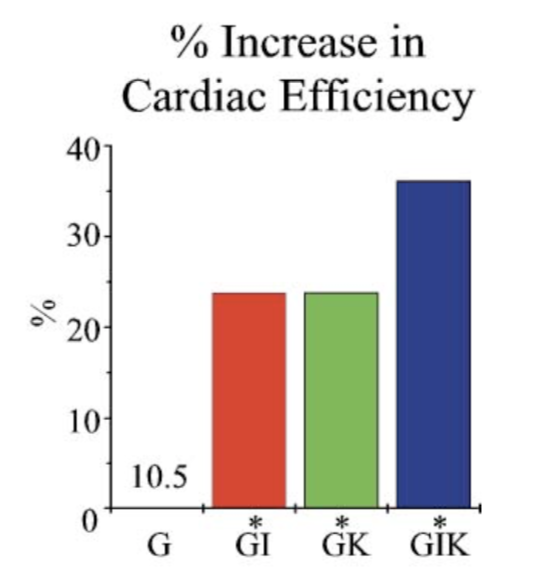 This means that efficiency was increased in these conditions (by ~28%) because for less oxygen consumption, the hearts delivered greater cardiac output and greater hydraulic work. The investigators found that this was because ketone metabolism resulted in greater “free energy per ATP molecule” (G). ATP is adenosine triphosphate and is the "energy currency" of biology. The “free energy” (∆G) of ATP represents how much potential energy is stored in each ATP molecule, and this value can shift slightly depending on the conditions inside the cell. The more negative the value of the ‘free energy’ of ATP, the more potential to do work the ATP molecule has. As an analogy, a tennis ball at the top of Mount Everest has more stored potential energy than the same ball at sea level. Whilst the absolute NUMBER of ATP produced per molecule of ketone oxidised and per oxygen required is fixed, the GREATER FREE ENERGY (potential energy) within the resulting ATP increases the cell’s capacity to do work. Ketones do not require insulin for their uptake as does glucose, entering the cell and also the mitochondria using monocarboxylate transporters. This means they can be broken down more rapidly than other fuels that have regulated uptake and regulated steps along their metabolic pathway. A high proportion of energy from ketone oxidation is transferred to the electron transport chain at the start (as NADH+), in comparison to the energy from fat, where a high proportion is transferred ‘downstream’ (as FADH). This means that, even though there is a high amount of ‘potential energy’ in a fat molecule, less of this can be transferred to ATP. Inhibition of histone deacetylase protiens. Provision of acetyl CoA, which can increase acetylation of DNA and other protiens. Inhinition of lypolysis (via HCAR1/PUMAG receptor). Post translational modification of protiens called "beta-hydroxybutyrlation." Inhibition of cholride dependant glutamate uptake (excitatory neurotransmittor). Increase synthesis of GABA (inhibitory neurotransmittor). Inhibits activation of NLRP3 inflammasome (pro inflammatory component of the innate immune system). Increasing release of brain derived neurotrophic factor. When the liver releases ketones, they first appear in the blood as BHB and AcAc. Exogenous ketones artificially raise the level of BHB or AcAc in the blood. Through natural conversion processes, ketones can appear in the urine or in the breath (as acetone). There are simple methods to test for ketones in blood, breath and urine, described below. In order to obtain the most comparable measures, it is useful to measure blood ketones at the same time each day. Measuring immediately on waking means that there are fewer potential variables that could alter the measurement, such as exercise, or different food intake. However, it can also be useful to check ketone levels around 60-90 minutes after an intervention such after eating a fat rich meal or consuming exogenous ketones. This method directly measures the amount of blood BHB that is present, either from endogenous production or after consuming exogenous ketones. The handheld devices that are available for home testing (such as FreeStyle by Abbott, or KetoMojo) require a small droplet of blood (obtained by a finger prick with a lancet) to be placed on a testing strip. A new testing strip must be used each time a reading is taken. The machine delivers a numerical blood BHB measurement in the unit milli molar (mM) after ~8 seconds. Most accurate home measurement device available. Expense of strips (~ $3 per strip for FreeStyle BHB test strips. KetoMojo offers blood BHB test strips for $0.99 each). Invasive: you need to take a finger prick sample. When the kidneys filter blood, metabolic substrates such as glucose and ketones are re-absorbed to prevent energy wastage. If blood levels of a metabolite exceed the capacity of the kidney to reabsorb them, then a ‘spillover’ effect occurs and the metabolite (i.e. glucose or ketones) appear in the urine. However, urine is not a very reliable measure. Firstly, whilst following a ketogenic diet, adaptation occurs over time that means more ketones are reabsorbed in comparison to the early phase of the diet9. Furthermore, at higher levels of ketones, the appearance in the urine does not correlate to levels in the blood10. Similarly, after consumption of exogenous ketones, urine ketone levels were not in proportion to the levels in the blood11 this may be because of the rapid onset of ketosis in comparison to when ketosis is achieved with fasting or diet. Therefore urine test strips are useful as a guide but have several disadvantages to their use to accurately quantify levels of ketosis. In order to measure urine ketone levels, you urinate onto the strip and wait for a few seconds for the strip to change colour, indicating the levels of ketones (acetic acid) present in the urine. There isn’t an exact reading given. Usually a dark purple colour corresponds to higher levels of ketones present. Cheap (100 strips cost ~$15). Widely available (online and in stores). Non numeric scale is less precise than blood (i.e, low, moderate, high ketosis). Over time, urine ketone reabsorption increases, hence blood levels may be higher than indicated by urine strip. Can be influenced by factors such as hydration. Overall less accurate than blood: over time the body adapts to excrete less ketones in the urine. Acetone is a molecule that results from the breakdown of acetoacetate. Acetone is commonly referred to as a ‘waste product’ as it is less readily used as energy compared to BHB (although some studies have shown that acetone can be oxidised as a fuel4. That said, some evidence suggests that it is responsible for the antiseizure effects of ketogenic diets so in may not be completely inert. At low levels acetone in the breath corresponds well to levels of ketones in the blood 12,13, however this is not the case as blood BHB levels increase 13 and if the increase is rapid, such as with exogenous ketone consumption11. Measuring breath acetone requires the one off purchase of a specialised handheld device. The reading is given in parts per million (ppm) of acetone. Cheap following initial purchase of device. Proportional relationship to blood BHB at lower levels12. Non numeric scale is less precise than blood. (i.e, low, moderate, high ketosis). Can be influenced by factors such as alcohol intake and hydration. Less accurate than blood, especially at higher ketone levels13. Reaching the state of total fatigue and the inability to continue exercising was shown to coincide with depletion of muscle glycogen. Athletes with more glycogen could sustain exercise for longer, i.e perform better14. Therefore consuming carbohydrate to replenish glycogen became standard dietary practice. Consuming carbohydrate drinks during exercise can increase performance15. “Fat burning’ ability peaks at a moderate intensity of exercise (~60% VO2 max) and then declines in athletes consuming a mixed diet16. This means that higher intensity exercise has an obligate need for some sort of carbohydrate from muscle glycogen or blood glucose. More recently a community of researchers and athletes have emerged who feel that following a ketogenic diet offers a performance advantage, especially to endurance sports where athletes are more likely to run out of stored carbohydrate during the event. However the evidence remains inconclusive and research is ongoing to provide a definitive answer to as to if a ketogenic diet offers a performance advantage. The ketogenic diet improves an athlete’s ability to burn fat: elite athletes who had adapted to long term to a ketogenic diet were able to burn twice as much fat as athletes on a normal mixed diet (1.6 vs 0.7 g/min) and at a higher percentage of their VO2 max (70 vs 55% VO2 max)17. An increase in fat burning ability could improve endurance capacity: as body fat represents a larger store of energy (150,000 kCal) compared to carbohydrate (2000 kCal), a greater ability to burn fat during exercise could prolong endurance performance. Whilst the theory appears sound, there is only one study showing an IMPROVEMENT in performance with a low carbohydrate diet18, with many showing no clear benefit of a low carbohydrate diet 19 ,20. Decreasing the amount of carbohydrate consumption required (as gels etc) could reduce the likelihood of gastrointestinal distress. Ketogenic diet appears to have no effect on muscle glycogen levels: despite consuming far less dietary carbohydrate, athletes who are adapted to the ketogenic diet did not have lower muscle glycogen stores than athletes who did consume carbohydrate17. Ketogenic diet could improve body composition: For some sports (such as gymnastics, cycling and some fighting sports), power to weight ratio is a key determinant of performance. Because the ketogenic diet has been associated with fat loss accompanied by lean muscle maintenance (or gain), it could thereby improve the power to weight ratio 21 ,22 and performance. Ketogenic diet could decrease exercise induced inflammation and increase well-being and recovery: athletes following a ketogenic diet have been reported to have improved well-being and recovery23. The ketogenic diet can compromise high intensity sprint performance: High intensity exercise performance is heavily reliant on the ability to produce energy via anaerobic respiration (glycolysis), which requires carbohydrate as a substrate. Following a ketogenic diet causes a decrease in the amount/activity of the enzymes in the glycolysis pathway that decreases the rate that the pathway can proceed24. This could explain the decrease in anaerobic sprint performance consistently seen with athletes following a ketogenic diet 25 ,23. An increase in fat burning ability could decrease the efficiency of exercise: one adaptation to a high fat diet is an increase in a process called mitochondrial uncoupling. This means that some of the stored energy from metabolic substrates is not used to generate ATP but is ‘dissipated’ leading to a decrease in efficiency of energy production 26 ,19. If calories are insufficient, the ketogenic diet can lead to fatigue23 and hormonal imbalance, especially during the transitional period. Notably, it can take several months to become fully ‘keto-adapted’ and performance can decline in the short term as these adaptations occur. It is also likely that individual responses to the diet vary. These factors make design and interpretation of sports science studies challenging and leave the door open for continued disagreement between scientists on each side of the debate. If you want to find out what each side has to say, we would recommend reading the comprehensive reviews by Louise Burke (who dislikes the use of the ketogenic diet)27 and Volek and Phinney (who promote the use of ketogenic diet)28. Allow 3-4 weeks of strict dietary adherence for the adaptation phase of the diet. Supplement with electrolytes (particularly sodium and potassium). Ensure calorie intake from fat is adequate for exercise needs. A good resource if you are an athlete looking to experiment with the ketogenic diet, The Art and Science of Low Carbohydrate Performance by Volek and Phinney. It is a small book that is a highly readable source of information from the experts in the field. To conclude, athletes may consider adopting a ketogenic diet in the hope of improving endurance, well being and body composition but unless the diet is well formulated they risk causing fatigue, under fuelling and ultimately compromising performance. There is currently insufficient scientific research to definitively support the use of ketogenic diet for athletes to improve performance, although beneficial effects on fat oxidation, body composition and well-being have been described. However, the anecdotal reports of success and the increasing number of pro and elite athletes claiming to be experimenting with the ketogenic diet is compelling. Furthermore, people who are training and competing at a sub elite level may have a greater net benefit from the effects of the diet on recovery, wellness and body composition that may outweigh the loss of top end power resulting from the diet. Finally, it is unknown if there would be a beneficial effect of following the ketogenic diet but adding in strategic carbohydrate refeeds around more intense training and competition periods. Given the popularity of the ketogenic diet, one hopes these questions will be addressed in the near future. Many athletes would not consider following a ketogenic diets due to the limited evidence of a performance enhancing effect, the risk of side effects having a negative impact on performance and the difficulty in maintaining the lifestyle changes required to stay in ketosis. Exogenous ketones offer a method to deliver some of the benefits of ketone metabolism without requiring athletes to follow a strict ketogenic diet. Taking exogenous ketones creates a metabolic state that would not normally occur naturally: the state of having full carbohydrate stores as well as elevated ketones. Ketone ester drinks can improve performance30. When taken with pre-exercise carbohydrates, a BHB-butanediol (BHB-BD) ketone ester allowed cyclists to ride 2-3% further in a 30 minute time trial than with carbohydrate alone. This is likely to be a combination effect of: Ketones themselves being a highly efficient fuel and improving muscle efficiency. Fuel availability is a key determinant of performance. By increasing the availability of an alternative fuel (ketones) during exercise this spares muscle carbohydrate stores for later in the exercise bout meaning more is available for the end of the test. Ketone esters (BHB-BD) lowers blood lactic acid 30. Lactic acid build up occurs during exercise as a result of burning carbohydrate at a high rate without enough oxygen. Blood lactic acid levels during exercise were 30% lower after ketone ester drinks compared to carbohydrate drinks. This is because high blood levels of BHB from the ketone ester drink slow down carbohydrate use and increase oxygen efficiency, which could decrease blood lactic acid levels. Ketone esters (BHB-BD) lowers glycogen use30. During exercise, the muscle breaks down stored carbohydrate (glycogen) to provide a fuel for the working muscle. When a ketone ester drink was taken pre-workout, the muscle used far less glycogen compared to when the pre-workout drink contained carbohydrate. The high levels of blood ketones meant that the muscle used ketones as a fuel before needing to use glycogen. Reducing reliance on muscle glycogen could improve performance and decrease the time for muscle glycogen to fully recover between exercise bouts. Ketone esters (BHB-BD) decreases muscle protein breakdown30. Exercise triggers the breakdown of some muscle proteins in order to top up metabolic processes inside the cell. This results in a rise in ‘branched chain amino acid’ levels inside the muscle after exercise. Taking a ketone ester drink before exercise decreased the exercise-induced rise in muscle branched chain amino acid levels. This could help to protect muscle during exercise. Ketone esters (BHB-BD) increases activation of protein synthesis 31. Following exercise, complex signalling pathways within the muscle are activated to trigger the synthesis of muscle protein. A key regulator of muscle protein synthesis is a ‘kinase’ enzyme called mTOR. When athletes mixed ketone ester with a protein and carbohydrate recovery drink , muscle samples revealed that mTOR was much more strongly activated with ketone drinks compared with carbohydrate control drinks. This could help to promote gain of muscle mass occurring as a result of exercise. Ketone esters (BHB-BD) could help to accelerate glycogen resynthesis32. After exercise that depletes muscle glycogen, the muscle uses carbohydrate from the diet to replenish these stores. An experiment was carried out where athletes undertook depletive exercise and then were given a ketone drink (or carbohydrate placebo) as well as glucose intravenously to maintain a high blood level (10mM). In this experiment, when the recovery drink contained ketone ester, more glucose was infused in order to maintain blood glucose at 10 mM, and muscle glycogen levels were 50% higher. However, the evidence is not conclusive: another study. 31 found that adding ketone ester to a protein and carbohydrate recovery drink did not enhance the normal rate of glycogen re-synthesis. The ketone body BHB can reduce oxidative stress and inflammation33 ,34, therefore, supplementing with BHB may reduce muscle damage, immune dysfunction and fatigue occurring during training, and may thus positively impact performance. However, this is still a relatively new field of research and there are many questions to be answered in order to understand how best to use exogenous ketone supplements. Ketone salts did not improve performance 35 ,36. There are two recent published studies of ketone salts on athletes.. Performance was compared between ketone salts vs. carbohydrate in a 4 minute cycling time trial and a 150 kJ ( ~10 mins) cycling time trial. In the 4 minute trial there was no change in performance, and in the 150 kJ test, performance was decreased by 7%. Reasons for the difference in findings could be: Lower levels of blood BHB levels (which peaked at 0.6 mM and 0.8 mM in these studies) meaning far less BHB was present than in the ketone ester study. The ketone salt was given without carbohydrate and so there was no additive effect of ketones + carbohydrate as seen in the ketone ester study. The tests used were short and highly reliant on anaerobic (glycolytic) metabolism, therefore ketones did not offer an advantage. Acetoacetate diester did not improve performance37: a different ketone ester to that used by Cox et al (an acetoacetate diester) decreased cycling performance by 2% given before a 50’ cycling race. Reasons for the difference in findings could be: this ketone ester drink was given along with a can of diet cola 30 mins before exercise and caused GI upset in many athletes. Delivering acetoacetate causes the muscle cells to become more ‘oxidised,’ which is a less favourable state for ATP production. Risk of some gastrointestinal upset with all ketone supplements. The dose, tonicity, time taken before competition and overall volume of a ketone drink will affect how easy it is to tolerate. Many athletes take ketone supplements without side effects, however there are differences between individuals, so practice with ketone supplements in training is advisable to ensure they don’t experience any GI side effects in competition. Geoff Woo discussed this study in a blog post. With the recent research findings, and the increasing availability of exogenous ketones, it is unsurprising that some authors have said (with a hint of skepticism) that they “could be the next magic bullet’ for athletes39. More research is required to understand the best use cases, doseage protocols, compounds etc, however it is clear that exogenous ketones are a new ‘tool’ in the athlete’s arsenal that can be used to provide an alternative, energetically favourable fuel source without needing dietary manipulation. Ketosis for Neurological Conditions: Epilepsy, Alzheimer's Disease, Parkinson's Disease, Traumatic Brain Injury and Mood Disorders. Ketones can cross the blood brain barrier, but fat does not. Production of ketones from fat, is a way to give the brain access to the large amount of kCal stored as fat. Ketones have relatively simple metabolism: only three enzymes involved in metabolizing BHB to acetyl-CoA, compared with the 11 biochemical steps to process glucose for TCA cycle entry. Ketones can account for up to 60% of brain energy needs when levels are elevated during a prolonged fast2. Ketones are an energetically efficient substrate for the brain: ketones decrease oxygen consumption, whilst increasing hydraulic work of the heart7 and increase sperm motility. For each 1mM increase in blood BHB, brain glucose metabolism decreases by ~10%40. Ketone metabolism in the brain increases cerebral blood flow41. Many neurological conditions share a common feature of impaired brain energy metabolism. It isn’t always clear if this impairment is the cause or the effect of the disease, but nonetheless, interventions that even partially restore or improve brain energy metabolism could help to prevent, slow or even reverse some conditions of the brain. Because ketones can: 1) get into the brain; 2) undergo metabolism by a distinct pathway that bypasses glucose metabolism, providing ketones by either following a ketogenic diet or by taking exogenous ketones could impact the natural course of some neurological conditions. Dysfunction of ion channels that control neurone activity42. Imbalance between excitatory (glutamate) and inhibitory (GABA) neurotransmitters in the brain. Ketone mediated decrease in neurone glutamate (excitatory) release44. Increased glutamate is associated with neurological disorders. Activation of potassium channels, decreasing the likelihood of neuronal firing and therefore seizure46. Following the ketogenic diet can lower blood glucose levels. Neuronal firing is dependent on blood glucose, so glucose restriction may limit a neuron's ability to maintain the high levels of synaptic activity required for seizures to occur46. Whilst the diet is broadly acknowledged to be safe strategy where medications have failed, side effects such as kidney stones, hyperlipidemia and can occur47. Furthermore, maintaining dietary adherence in young school age children can be very challenging for caregivers. Exogenous ketones may be an alternative or a adjunct to the ketogenic diet in epilepsy. Early work suggests that exogenous ketones could have antiseizure effects. Injection of the ketones acetoacetate and acetone have been found to have anticonvulsant properties in animal models48, and an acetoacetate diester was found to protect against seizures in rats exposed to high levels of oxygen49. Further studies are required to understand specifically how ketone bodies affect seizure control, however for children who experience daily seizures a combination of the ketogenic diet and exogenous ketones could be helpful to manage their condition. In Alzheimer’s disease (AD), the function of the brain is compromised by the buildup of debris (plaques and tangles) inside the neurons. This mainly occurs in the areas of the brain associated with memory, intelligence, judgement, behaviour and language and impairs the ability to complete normal day to day tasks and to interact socially. Whilst the symptoms of AD usually only begin to appear with age, evidence suggests that damage to the brain begins to accumulate years earlier. This includes the buildup of plaques and tangles and a decreased ability to metabolise glucose (brain insulin insensitivity)50. If an individual has Type 2 Diabetes (systemic insulin insensitivity), the risk of AD is tenfold higher51. As ketones are the only other metabolic substrate that can fuel the brain, there is a compelling mechanism whereby ketosis could improve brain energy metabolism and therefore improve symptoms of AD. Despite a declining ability of the brain to use glucose, cerebral ketone metabolism is preserved in AD (Castellano2015). This means that ketosis could be used to prevent an energy deficit in the brain. Another possibility is that ketone metabolism decreases mitochondrial damage caused by oxidative stress in the brain52. Individuals with AD tend to have increased mitochondrial oxidative stress, which can worsen brain energy production and increase plaque and tangle formation53. Clinical trials of various ketogenic agents have shown promising outcomes in AD. Recently, a case report was published describing a dramatic improvement in cognitive function in a patient consuming daily drinks of a ketone ester of beta-hydroxybutyrate-butanediol54. This corroborates evidence from animal studies of AD, which showed behavioural and anatomical improvements in AD mice treated with the same ketone ester55. Also, medical foods containing medium chain triglycerides can give an acute improvement in cognitive scores in AD patients 56 ,57. The effectiveness of this treatment was found to depend on the absence of a gene variant that has been associated to increased chance of AD, called APOE4. Finally, following a ketogenic diet for 6 weeks improved the symptoms of mild cognitive impairment58. It is still early days, but the use of ketogenic diets and exogenous ketones may help to improve the quality of life of patients with dementia and their caregivers. One hypothesised contributor to neuronal death is insufficient energy production, secondary to impaired mitochondrial function. However, it is unclear if this is in fact a cause or effect of PD. Whatever the case may be, patients with PD have been shown to have impaired mitochondrial energy production in the brain59 and lower brain glucose utilisation60. Another factor may be neuro-inflammation, which is also common in PD, and is thought to lead to further accumulation of Lewy Bodies and neuronal death. Ketosis could benefit patients with PD, as ketones provide an alternative energy source to the brain and also have antiinflammatory effects. Several research groups have shown that the ketogenic diet can have manifold beneficial effects in animal models of PD: alleviating motor symptoms, reducing inflammation, decreasing neuronal loss 61 ,62. Also, an in vitro model of PD (neurons in culture treated with a drug called MPTP) was used to demonstrate that addition of 4 mM of BHB was protective against neurodegeneration52. An early study of the ketogenic diet in PD patients reported very promising results: patients improved their clinical PD ‘score,’ as classified by factors including tremor, balance and mood 63. Whilst there are promising results, further clinical studies are required to demonstrate if the ketogenic diet or exogenous ketones (either alone or in combination) are a tolerable and efficacious intervention for PD. Concussion (a mild form of TBI), is defined as a short term impairment of brain function caused by impact. Symptoms include dizziness, confusion and headache. When the brain suffers a concussive impact this triggers an acute cascade of cellular events that can eventually cause chronic problems. Firstly, immediately after impact there are changes to the concentrations of ions and neurotransmitters in and outside of the neurones. For example, the cells release potassium and glutamate (excitatory neurotransmitter); this can cause neuronal damage instantly64. The disruption to the equilibrium of substances within the brain must be corrected, which requires the action of the ATP dependant ion pumps in the cell membranes. In order to produce enough ATP the brain has a transient period of high glucose metabolism (within 30 minutes of impact), which is followed by a period of glucose metabolic depression that can last anywhere from 5 days to several months, depending on severity65. In this time the brain is starved of energy when it is unable to metabolise glucose, which can cause long term damage. Severe or repeated impacts can lead to development of conditions such as chronic traumatic encephalopathy (CTE). Theoretically, supplying ketones during this period of compromised glucose metabolism could prevent the energy deficit and reduce the likelihood of long-term brain damage. This could be because ketones can act as an alternative, highly energy efficient substrate7. Additionally, the antioxidant, antiinflammatory33 and anti-apoptosis properties of ketones (i.e ketones prevent the opening of the mitochondrial permeability transition pore, which causes cell death66) could protect against neuronal loss and damage. Practically speaking, because it takes several days to raise blood ketone levels by following the ketogenic diet it has been virtually impossible to study the effects of ketosis on brain injury in humans. It is also complicated by the difficulty in quantifying the extent of the damage without repeated imaging and there is a lack of reliable biomarkers for concussion. Furthermore, concussions can’t be ‘administered’ to humans experimentally, making it impossible to study in a controlled setting. Therefore much of the proof of concept research looking a ketosis for concussion has been done in animals. Nevertheless, the results are promising: rats who were given a ketogenic diet or ketone precursors before67 and after68 a controlled concussive injury have were found to have improved brain energy metabolism, and improved cognitive and motor function post injury. Also, giving exogenous ketones as an injection post-injury protected the brain against glutamate induced excitotoxicity69 and alleviated the decrease in brain ATP that occurs due to the depression of glucose metabolism70. Therefore, as scientists’ ability to quantify concussion in humans improves, ketosis could be an interesting intervention to attempt to reduce the harmful after-effects. Other Emerging Areas: Mood Disorders, Migraine, Autism. Research looking at the applications of ketosis in other neurological conditions is at its very early stages, but already interesting results are emerging in the areas of mood, migraine and autism amongst others. Recent studies indicate that mood disorders such as depression and anxiety can be linked to a range of physical changes in the brain, such as inflammation or change in gene expression71. Early results from animal studies have shown that ketosis could improve mood disorders, although the mechanism is still unclear. Rats fed exogenous ketones for several weeks showed reduced anxiety behaviours72. Similarly, endogenous and exogenous BHB alleviated depressive behaviour in mice subjected to stress73. This was found to be linked to altered epigenetic markers (modifications to DNA that affect the degree of gene expression) and an increased amount of brain derived neurotrophic factor (BDNF) in the brain. At this time, there are no trials investigating the effects of ketosis in human patients with mood disorders. Recurrent migraines are highly prevalent and sometimes debilitating. They manifest as throbbing, one-sided headaches and can also involve visual disturbances (aura). Many of the processes involved in migraine are shared with those implicated in epilepsy, especially an abnormally high glutamate (excitatory) activity. In fact, medical professionals sometimes prescribe anti seizure medications that block glutamate activity to migraine patients. The ketogenic diet has been associated with improved migraine control both anecdotally and in a small number of case studies 74 ,75 ,76 ,77. Researchers are currently undertaking further investigations to confirm if the ketogenic diet or exogenous ketones are viable and effective treatment options for migraine patients. Some investigators feel that mitochondrial dysfunction and compromised brain glucose metabolism may play a role in the development of autism. As autism is sometimes accompanied by seizures such as those seen in epilepsy (which could be improved by the ketogenic diet), the diet has been trialled in a small number of case studies. These cases have shown that the ketogenic diet can lead to improvements in the childhood autism rating scale score 78 ,79, however dietary adherence may prove even more of a challenge with these children, decreasing the viability of the ketogenic diet as an intervention. Given the prevalence of this category of illness, and the insidious nature of the conditions, an intervention with minimal side effects (vs. drugs) such as ketosis could be used as a first line intervention before attempting treatment with medication in some cases. However, there is still some way to go before research can conclusively address this possibility, individuals considering the diet should do so with full medical supervision. In recent times there has been an exponential increase in the rates of obesity and diabetes. Popular opinion has blamed (in turn) overconsumption of fat, overconsumption of carbs and sugar and overconsumption of calories. Whilst the overall calorie balance is a crucial factor that cannot be overlooked, it is also the case that different macronutrients in the diet (especially carbs and fat) have different effects on the body when consumed. The macronutrient profile of a ketogenic diet itself (low carbohydrate, high fat, restricted protein) causes several beneficial changes to hormone levels and metabolism that lead to either a voluntary decrease in calories consumed or an inherent increase in the body’s metabolic rate. This may explain why the diet is effective for weight loss. Lower levels of insulin secretion. Increased lipolysis (fat release from adipocytes). Decreased lipogenesis (process of making new fat). Decreased resting respiratory quotient and thus greater reliance on lipid oxidation. Increased basal metabolic rate due to decreased mitochondrial efficiency through increased expression of uncoupling proteins81. Greater satiety,82 which may result in decreased voluntary calorie consumption. Increased metabolic cost of gluconeogenesis (making glucose from protein) represented by the thermic effect of proteins83. However, it is possible that ketosis alone may also help weight loss (i.e an effect caused by BHB rather than by the nutrients in the diet). BHB infusions reduce food intake and body weight in animals 84 ,85. BHB increases the expression of orexigenic (hunger-promoting) peptides in the appetite regulating cells of the brain86. In a meta analysis, which combines results from all available similar studies, the state of ketosis (>0.5mM BHB) was related to reduced appetite87. Ketone ester drinks reduce appetite and levels of the hunger hormone (ghrelin) compared to the same calories as carbohydrate88. A similar effect of ketosis on ghrelin and appetite was also seen in patients following a ketogenic diet89. Lately anecdotal evidence has been building that a ketogenic diet can yield transformative results with respect to weight loss: with people taking to social media to share ‘before and after keto’ photos and to stories of ‘how keto changed my life.’ Despite this, concrete clinical evidence confirming that a ketogenic diet is superior to any other diet that creates a calorie deficit is lacking. At the moment the most accurate statement is that ‘the best diet for you is one you can stick to,” a pattern of eating that maintains a small calorie deficit should, over time, lead to weight loss. Cell growth and division is usually tightly controlled. Cancer cells tend to have genetic mutations that turn on their internal growth pathways and inactivate tumor suppression pathways. Normal cells are sensitive to external signals that slow and control their growth. Cancer cells lose this sensitivity which contributes further to their multiplication. Usually the immune system can detect and destroy malfunctioning cells. Cancer cells do not trigger activation of the immune system in the same way that damaged or malfunctioning cells usually do. Normal cells have a limited number of times that they can divide to replicate, but cancer cells acquire the ability to replicate indefinitely. Metastasis refers to the process whereby cancer cells spread from their tissue of origin (i.e the lung) to other parts of the body (i.e the brain). This is the feature of some types of cancer that makes it so difficult to treat and eventually leads to > 90% of deaths. Angiogenesis means triggering the growth of new blood vessels. Usually this is tightly regulated, however cancer cells can cause abnormal angiogeneis. This is important for the survival and growth of the tumor, as blood vessels deliver essential oxygen and nutrients. In cancer, defects occur in the pathways that usually repair damaged DNA, meaning that more DNA mutations occur and at a faster rate. Normal cells have a pathway called apoptosis that triggers them to self-destruct if they start to malfunction. Cancer cells acquire the ability to avoid triggering apoptosis. Cancer cells often lose the ability to produce energy aerobically in the mitochondria. This means they shift to a more anaerobic, glycolytic pattern of energy production. When producing energy like this, the cells release lactic acid, which can cause further mutations and fuel the growth of neighboring cancer cells. It is still unclear what is the very first step that occurs in a normal cell becoming cancerous. Two theories that explain the development of cancer are the ‘somatic mutation’ theory, and the ‘metabolic theory.’ The somatic mutation theory states that the first event in cancer is a gene mutation due to environmental damage or a mistake in the DNA replication and repair processes. This gene mutation initiates a cascade of events that subsequently leads to tumour growth. Popular opinion favoured the somatic mutation theory for many years, leading to a large body of research describing the different genetic mutations of cancer cells, and ambitious projects to sequence the ‘Cancer Genome.’ From the compelling simplicity of the somatic mutation theory, an increasingly complicated picture has emerged as more than 100 oncogenes and 30 tumor suppressor genes have been identified, leading researchers to look for alternative explanations. The metabolic theory states that the root cause of cancer is a defect in mitochondrial energy production or ‘an irreversible injuring in respiration’91. Once the cells ability to produce energy is compromised, this is hypothesised to lead to the subsequent accumulation of changes that make the cell cancerous92. A key change is decreased mitochondrial glucose metabolism in cancer cells. Cancer cells ferment glucose to lactate (which happens outside of the mitochondria) at a much higher rate than normal cells93, in a change called ‘The Warburg Effect.’ This implicates damage to the mitochondria and failure in energy production as a central process of cancer progression. As both gene mutations and de-regulated metabolism are both present in cancer, it is unclear which is the ‘chicken’ and which is the ‘egg.’ However taking a metabolic view of cancer leads to the possibility of changing the course of the disease by altering the whole body metabolism through nutritional interventions. such as the ketogenic diet. Following a low calorie diet: The exact mechanism whereby caloric restriction can slow or prevent cancer is unknown. It may be linked to: decreased blood glucose (less fuel for cancer cells), raised ketones (antiinflammatory, decreased oxidative stress, decreased ability to use glucose) . Animal models have shown that caloric restriction is closely related to tumour incidence and progression94. Fasting: As with caloric restriction, any benefits of fasting are likely to stem from the lowering of glucose, and insulin plus the elevation of ketone bodies. However, fasting may not be a good fit for patients who are already subject to a huge physiologic stress, particularly when being treated with chemotherapy or radiotherapy. Patients are frequently immunocompromised and may also experience muscle wastage (cachexia). However, fasting may sensitise cells to the effects of chemotherapy95, so a short fast prior to a treatment cycle could potentiate the drug’s efficacy. The ketogenic diet: The ketogenic diet could affect cancer by a similar mechanism to calorie restriction and fasting. Of the 29 animal studies that have examined ketogenic diet and cancer, 72% of them have demonstrated an anti tumor effect. There have been a small number of case studies of the safety and efficacy of the ketogenic diet in humans. The results have been largely positive, for example following a ketogenic diet helped to stabilise tumour growth and alter tumor metabolism96 ,97 ,98. There is an absence of fully randomised clinical trials in humans, but 24 case studies have been published; one recent appraisal of the case study data said that “ a probabilistic argument shows that the available data strengthen the belief in the anti-tumor effect hypothesis (of the ketogenic diet) at least for some individuals"99. Exogenous ketones: Very little is known about the effects of exogenous ketones on cancer. However, as exogenous ketones can also lower blood sugar and elevate BHB they could be helpful by a similar mechanism to the ketogenic diet. Exogenous ketones may even be preferable to the ketogenic diet, as patients can eat a wider range of palatable and calorically dense food to maintain their strength during treatment. One animal study showed that ketone ester supplementation (acetoacetate diester) decreased tumour size and prolonged the survival of mice with metastatic cancer100. Ultimately, cancer is highly complex, whereas some tumors may be highly responsive to carbohydrate restriction, others may become adapted to utilise fats or ketones. Cancer, and the treatments currently in use cause unpleasant systemic effects such as muscle wasting and compromise of the immune system, therefore any interventions should be undertaken under the guidance of a doctor. There are limited treatment options available for some types of cancer, many drugs have toxic side effects and many types of cancer have a poor prognosis. In these cases, considering metabolism as an adjunct to conventional treatments is interesting, and offers the potential of another avenue of attack on cancer. The hallmark of diabetes is abnormally high concentrations of blood glucose. Blood glucose is usually regulated by the hormone insulin. Following a carbohydrate rich meal, blood glucose rises. Insulin is then released by the pancreas and binds to receptors around the body and causes the cells to take up glucose from the blood. There are two main types of diabetes. In Type I diabetes, the insulin producing cells in the pancreas are destroyed by an immune response resulting in insulin deficiency. In Type II diabetes insulin is still secreted, but the cells in the body no longer respond adequately and so glucose uptake is not triggered. Sometimes pregnancy can trigger a period of diabetes (gestational diabetes), which resolves after giving birth. Type I diabetes is usually treated by insulin injections, that replace the body’s own insulin production. In Type I diabetics, lowering dietary carbohydrate consumption can reduce the need to inject insulin to lower blood sugar101. However, because they do not release any insulin Type I diabetics can be at risk of developing a complication called “Diabetic Ketoacidosis” (DKA). DKA occurs because, alongside its effects on glucose, insulin has other effects in the body. Insulin normally inhibits the release of fat (lipolysis) from adipose tissue. In Type I diabetics, the lack of insulin can lead to high levels of lypolysis, high levels of fatty acids in the blood, this then drives rapid and uncontrolled liver ketone production. The symptoms of DKA are weakness, confusion and deep gasping breathing. In order to avoid developing DKA while following a ketogenic diet, Type I diabetics should seek medical supervision and closely monitor their glucose and ketone levels if reducing their dietary carbohydrate intake. Lower fasting blood glucose: Fasting blood glucose gives a good snapshot of insulin sensitivity. In a healthy person, fasting blood glucose is , in pre-diabetes , and in diabetics this can exceed . A clinical study comparing a low calorie ketogenic diet to a low calorie diet showed that following the ketogenic diet resulted in lower blood glucose and lipid levels even if subjects were maintained at a constant weight 102 ,103. Lower HbA1c: HbA1c is an abbreviation for ‘glycosylated hemoglobin.’ Hemoglobin is a protein inside red blood cells, this means it is always exposed to the substances that circulate in the blood (i.e glucose). When glucose levels are high, glucose can bind to hemoglobin (i.e it becomes glycoyslated). As red blood cells survive inside the body for 100-120 days, the amount of glyosylated hemoglobin is a good indicator of long term glucose control. The healthy limit for HbA1C is below 5.7% (Source: WebMD). Weight loss: Obesity is a significant risk factor for diabetes and diabetic complications. Although no weight loss is required for carbohydrate restriction to be beneficial, low carbohydrate diets are highly efficacious for weight loss101. Improved insulin markers: In Type II diabetes, fasting insulin levels are often elevated, and insulin has less of an effect (meaning it takes longer for blood glucose to fall after the post-meal increas). Whilst evidence is not conclusive, some studies have claimed to demonstrate an improvement in insulin sensitivity with the ketogenic diet104. The evidence supporting a decrease in fasting insulin levels with a ketogenic diet has been demonstrated more consistently 104 , 105 . Most of these benefits occur due to the decrease in dietary carbohydrate intake; it is largely unknown what role ketones themselves play in the efficacy of the diet. Because of this, it is unclear how exogenous ketones could be used to help treat diabetes. One effect that is consistently reported is that ketone ester and ketone salt drinks and infusions lower blood glucose and lipid levels 11,106 ,107. It is also possible that exogenous ketones have a positive effect on insulin sensitivity; ketone ester supplementation increased insulin sensitivity in rodents by 73%108. It is possible that exogenous ketones could be used alongside diet and lifestyle changes to help control blood in diabetes, but further research must be done before this can be realised. Finally, an important consideration is the effect of the ketogenic diet on blood lipids. This is because the levels of various lipids in the blood have been shown to predict the likelihood of cardiovascular disease. Lipids and cholesterol are carried through the blood in biochemical assemblies called ‘lipoproteins,’ because they do not dissolve in water. There are two broad classes of lipoproteins in the blood: high density lipoprotein (HDL) and low density lipoprotein (LDL). HDL is thought of as more ‘healthy’ (H = ‘Healthy’) because it responsible for moving cholesterol and lipids from the peripheral tissues into the liver for metabolism. LDL is demonised as bad cholesterol (L = ‘Lethal’), levels are elevated after a fatty meal and elevated LDL is associated with cholesterol build up in the arteries. Blood tests often report the level of total cholesterol (HDL + LDL) as well as the levels of each type independently. It is possible that the relative abundance (ratio) of HDL: LDL is more important to predict the occurrence of cardiovascular disease that the total cholesterol level109. Whilst the ketogenic diet can cause an increase in total cholesterol, the ratio of healthy HDL : less healthy LDL generally increases (i.e more HDL)110 whilst following a ketogenic diet. In contrast, whilst total cholesterol tends to be lower whilst following a low fat diet, the ratio of HDL:LDL tends to be lower (i.e more LDL)21. Another lipid marker of interest is blood triglyceride levels. Blood triglycerides are frequently elevated in the metabolic syndrome, and are a risk factor for cardiovascular disease111. A common misconception is that consuming high levels of fat leads to persistently high levels of blood triglycerides. However, there is data that suggests that a high fat diet does not affect blood triglyceride levels, and may even lower them21 ,112, especially following a period of adaptation113. The effects of a ketogenic diet on cholesterol and triglycerides is complex. It is dependant on the exact composition of the diet, the genetic and physical characteristics of the individuals studied and other hormonal and environmental factors. Therefore, blood lipid changes whilst on the ketogenic diet can vary between individuals. This means that it is advisable to track your personal levels by having a blood test before starting the ketogenic diet and to follow this with regular testing to monitor any changes. Finally, exogenous ketones have been shown to decrease the levels of triglycerides and free fatty acids in the blood after one drink 107 ,106 ,11. There is also early data showing that ketone ester consumption decreases cholesterol biosynthesis in rodents, an effect which appeared to be conserved in humans114. It is unclear at this stage what the long term effects of exogenous ketone consumption on blood lipids and cholesterol would be, but this is an area of promising research. 1. Cahill, G.F., Jr. (1970). Starvation in man. New Engl J Med 282, 668-675. 2. Owen, O.E., Morgan, A.P., Kemp, H.G., Sullivan, J.M., Herrera, M.G., and Cahill, G.F. (1967). Brain Metabolism during Fasting. J. Clin. Invest. 46, 1589-&. 3. Cahill, G.F., Jr. (2006). Fuel metabolism in starvation. Annu Rev Nutr 26, 1-22. 4. Kalapos, M.P. (2003). 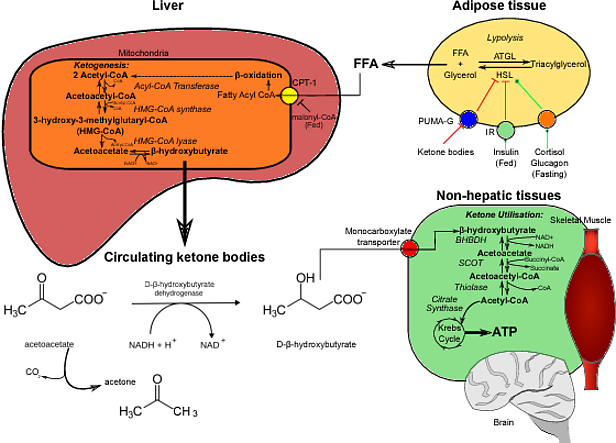 On the mammalian acetone metabolism: from chemistry to clinical implications. Biochimica et biophysica acta 1621, 122-139. 5. Halestrap, A.P., and Price, N.T. (1999). The proton-linked monocarboxylate transporter (MCT) family: structure, function and regulation. Biochem. J. 343 Pt 2, 281-299. 6. Veech 2014: The therapeutic implications of ketone bodies: the effects of ketone bodies in pathological conditions: ketosis, ketogenic diet, redox states, insulin resistance, and mitochondrial metabolism. Prostaglandins Leukot Essent Fatty Acids. 2004 Mar;70(3):309-19. 7. Sato, K., Kashiw.aya, Y., Keon, C.A., Tsuchiya, N., King, M.T., Radda, G.K., Chance, B., Clarke, K., and Veech, RL. (1995). Insulin, ketone bodies, and mitochondrial energy transduction. FASEB J. 9, 651-658. 8. Newman, J.C., and Verdin, E. (2017). Ketone bodies as signaling metabolites. Trends Endocrinol. Metab. 25, 42-52. 9. Rabast, U., Vornberger, K.H., and Ehl, M. (1981). Loss of weight, sodium and water in obese persons consuming a high- or low-carbohydrate diet. Ann. Nutr. Metab. 25, 341-349. 10. Taboulet, P., Deconinck, N., Thurel, A., Haas, L., Manamani, J., Porcher, R., Schmit, C., Fontaine, J.P., and Gautier, J.F. (2007). Correlation between urine ketones (acetoacetate) and capillary blood ketones (3-beta-hydroxybutyrate) in hyperglycaemic patients. Diabetes Metab. 33, 135-139. 12. Musa-Veloso, K., Likhodii, S.S., and Cunnane, S.C. (2002). Breath acetone is a reliable indicator of ketosis in adults consuming ketogenic meals. Am J Clin Nutr 76, 65-70. 13. Goschke, H., and Lauffenburger, T. (1975). [Breath acetone and ketonemia in normal- and overweight subjects during total fasting (author's transl)]. Research in experimental medicine. Zeitschrift fur die gesamte experimentelle Medizin einschliesslich experimenteller Chirurgie 165, 233-244. 14. Bergström, J., Hermansen, L., Hultman, E., and Saltin, B. (1967). Diet, muscle glycogen and physical performance. Acta physiologica scandinavica 71, 140-150. 15. Currell, K., and Jeukendrup, A.E. (2008). Superior endurance performance with ingestion of multiple transportable carbohydrates. Med Sci Sport Exer 40, 275-281. 16. van Loon, L.J., Greenhaff, P.L., Constantin-Teodosiu, D., Saris, W.H., and Wagenmakers, A.J. (2001). The effects of increasing exercise intensity on muscle fuel utilisation in humans. J Physiol (Lond) 536, 295-304. 17. Volek, J.S., Freidenreich, D.J., Saenz, C., Kunces, L.J., Creighton, B.C., Bartley, J.M., Davitt, P.M., Munoz, C.X., Anderson, J.M., Maresh, C.M., et al. (2016). Metabolic characteristics of keto-adapted ultra-endurance runners. Metabolism 65, 100-110. 18. Lambert, E.V., Speechly, D.P., Dennis, S.C., and Noakes, T.D. (1994). Enhanced endurance in trained cyclists during moderate intensity exercise following 2 weeks adaptation to a high fat diet. Eur. J. Appl. Physiol. Occup. Physiol. 69, 287-293. 19. Burke, L.M., Ross, M.L., Garvican-Lewis, L.A., Welvaert, M., Heikura, I.A., Forbes, S.G., Mirtschin, J.G., Cato, L.E., Strobel, N., Sharma, A.P., et al. (2017). Low carbohydrate, high fat diet impairs exercise economy and negates the performance benefit from intensified training in elite race walkers. J. Physiol. 595, 2785-2807. 20. Zajac, A., Poprzecki, S., Maszczyk, A., Czuba, M., Michalczyk, M., and Zydek, G. (2014). The effects of a ketogenic diet on exercise metabolism and physical performance in off-road cyclists. Nutrients 6, 2493-2508. 21. Volek, J.S., Sharman, M.J., Love, D.M., Avery, N.G., Gomez, A.L., Scheett, T.P., and Kraemer, W.J. (2002). Body composition and hormonal responses to a carbohydrate-restricted diet. Metabolism 51. 22. Paoli, A., Grimaldi, K., D'Agostino, D., Cenci, L., Moro, T., Bianco, A., and Palma, A. (2012). Ketogenic diet does not affect strength performance in elite artistic gymnasts. J Int Soc Sports Nutr 9, 34. 23. Caryn Zinn, Matthew Wood, Mikki Williden, Simon Chatterton, and Ed Maunder. 24. Stellingwerff, T., Spriet, L.L., Watt, M.J., Kimber, N.E., Hargreaves, M., Hawley, J.A., and Burke, L.M. (2006). Decreased PDH activation and glycogenolysis during exercise following fat adaptation with carbohydrate restoration. Am J Physiol Endocrinol Metab 290. 25. Havemann, L., West, S., Goedecke, J., Macdonald, I., Gibson, A., Noakes, T., and Lambert, E.V. (2006). Fat adaptation followed by carbohydrate loading compromised high-intensity sprint performance. J Appl Physiol 100. 26. Edwards, L.M., Murray, A.J., Holloway, C.J., Carter, E.E., Kemp, G.J., Codreanu, I., Brooker, H., Tyler, D.J., Robbins, P.A., and Clarke, K. (2011). Short-term consumption of a high-fat diet impairs whole-body efficiency and cognitive function in sedentary men. FASEB J. 25, 1088-1096. 27. Burke, L.M. (2015). Re-Examining High-Fat Diets for Sports Performance: Did We Call the 'Nail in the Coffin' Too Soon? Sports Med 45 Suppl 1, S33-49. 28. Volek, J.S., Noakes, T.D., and Phinney, S.D. (2015). Rethinking fat as a performance fuel. Eur J Sport Sci 15. 29. Phinney, S.D. (2004). Ketogenic diets and physical performance. Nutr. Metab. 1. 30. Cox, P.J., Kirk, T., Ashmore, T., Willerton, K., Evans, R., Smith, A., Murray, Andrew J., Stubbs, B., West, J., McLure, Stewart W., et al. (2016). Nutritional Ketosis Alters Fuel Preference and Thereby Endurance Performance in Athletes. Cell Metabolism 24, 1-13. 31. Vandoorne, T., De Smet, S., Ramaekers, M., Van Thienen, R., De Bock, K., Clarke, K., and Hespel, P. (2017). Intake of a Ketone Ester Drink during Recovery from Exercise Promotes mTORC1 Signaling but Not Glycogen Resynthesis in Human Muscle. Front. Physiol. 8, 310. 32. Holdsworth, D.A., Cox, P.J., Kirk, T., Stradling, H., Impey, S.G., and Clarke, K. (2017). A Ketone Ester Drink Increases Postexercise Muscle Glycogen Synthesis in Humans. Med Sci Sports Exerc. 33. Youm, Y.-H., Nguyen, K.Y., Grant, R.W., Goldberg, E.L., Bodogai, M., Kim, D., D'Agostino, D., Planavsky, N., Lupfer, C., Kanneganti, T.D., et al. (2015). The ketone metabolite [beta]-hydroxybutyrate blocks NLRP3 inflammasome-mediated inflammatory disease. Nat. Med. 21, 263-269. 34. Forsythe, C.E., Phinney, S.D., Fernandez, M.L., Quann, E.E., Wood, R.J., Bibus, D.M., Kraemer, W.J., Feinman, R.D., and Volek, J.S. (2008). Comparison of low fat and low carbohydrate diets on circulating fatty acid composition and markers of inflammation. Lipids 43, 65-77. 35. Rodger, S., Plews, D., Laursen, P., and Driller, M. (2017). The effects of an oral β-hydroxybutyrate supplement on exercise metabolism and cycling performance. 36. O’Malley, T., Myette-Cote, E., Durrer, C., and Little, J.P. (2017). Nutritional ketone salts increase fat oxidation but impair high-intensity exercise performance in healthy adult males. Applied Physiology, Nutrition, and Metabolism, 1-5. 37. Leckey, J.J., Ross, M.L., Quod, M., Hawley, J.A., and Burke, L.M. (2017). Ketone Diester Ingestion Impairs Time-Trial Performance in Professional Cyclists. Front. Physiol. 8, 806. 38. Braakhuis, A.J., and Hopkins, W.G. (2015). Impact of Dietary Antioxidants on Sport Performance: A Review. Sports Medicine 45, 939-955. 39. Pinckaers, P.J.M., Churchward-Venne, T.A., Bailey, D., and van Loon, L.J.C. (2017). Ketone Bodies and Exercise Performance: The Next Magic Bullet or Merely Hype? Sports Medicine 47, 383-391. 40. LaManna, J.C., Salem, N., Puchowicz, M., Erokwu, B., Koppaka, S., Flask, C., and Lee, Z. (2009). KETONES SUPPRESS BRAIN GLUCOSE CONSUMPTION. Advances in experimental medicine and biology 645, 301-306. 41. Hasselbalch, S.G., Madsen, P.L., Hageman, L.P., Olsen, K.S., Justesen, N., Holm, S., and Paulson, O.B. (1996). Changes in cerebral blood flow and carbohydrate metabolism during acute hyperketonemia. Am J Physiol 270, E746-751. 42. Stafstrom, C.E. (2007). Persistent sodium current and its role in epilepsy. Epilepsy Curr. 7, 15-22. 43. Vining, E.P., Freeman, J.M., Ballaban-Gil, K., Camfield, C.S., Camfield, P.R., Holmes, G.L., Shinnar, S., Shuman, R., Trevathan, E., and Wheless, J.W. (1998). A multicenter study of the efficacy of the ketogenic diet. Arch. Neurol. 55, 1433-1437. 44. Juge, N., Gray, J.A., Omote, H., Miyaji, T., Inoue, T., Hara, C., Uneyama, H., Edwards, R.H., Nicoll, R.A., and Moriyama, Y. (2010). Metabolic Control of Vesicular Glutamate Transport and Release. Neuron 68, 99-112. 45. Yudkoff, M., Daikhin, Y., Horyn, O., Nissim, I., and Nissim, I. (2008). Ketosis and Brain Handling of Glutamate, Glutamine and GABA. Epilepsia 49, 73-75. 46. Bough, K.J., and Rho, J.M. (2007). Anticonvulsant Mechanisms of the Ketogenic Diet. Epilepsia 48, 43-58. 47. Keene, D.L. (2006). A systematic review of the use of the ketogenic diet in childhood epilepsy. Pediatr. Neurol. 35, 1-5. 48. Likhodii, S.S., and Burnham, W.M. (2002). On the Anticonvulsant Effect of Acetone and the Ketogenic Diet. Epilepsia 43, 1596-1599. 49. D'Agostino, D.P., Pilla, R., Held, H.E., Landon, C.S., Puchowicz, M., Brunengraber, H., Ari, C., Arnold, P., and Dean, J.B. (2013). Therapeutic ketosis with ketone ester delays central nervous system oxygen toxicity seizures in rats. Am. J. Physiol. Regul. Integr. Comp. Physiol. 304, R829-836. 50. Cunnane, S.C., Courchesne-Loyer, A., St-Pierre, V., Vandenberghe, C., Pierotti, T., Fortier, M., Croteau, E., and Castellano, C.A. (2016). Can ketones compensate for deteriorating brain glucose uptake during aging? Implications for the risk and treatment of Alzheimer's disease. Ann. N. Y. Acad. Sci. 1367, 12-20. 51. Talbot, K., Wang, H.Y., Kazi, H., Han, L.Y., Bakshi, K.P., Stucky, A., Fuino, R.L., Kawaguchi, K.R., Samoyedny, A.J., Wilson, R.S., et al. (2012). Demonstrated brain insulin resistance in Alzheimer's disease patients is associated with IGF-1 resistance, IRS-1 dysregulation, and cognitive decline. J. Clin. Invest. 122, 1316-1338. 52. Kashiwaya, Y., Takeshima, T., Mori, N., Nakashima, K., Clarke, K., and Veech, R.L. (2000). d-β-Hydroxybutyrate protects neurons in models of Alzheimer's and Parkinson's disease. Proc. Natl. Acad. Sci. U. S. A. 97, 5440-5444. 53. Smith, M.A., Rottkamp, C.A., Nunomura, A., Raina, A.K., and Perry, G. (2000). Oxidative stress in Alzheimer’s disease. Biochimica et Biophysica Acta (BBA) - Molecular Basis of Disease 1502, 139-144. 54. Newport, M.T., VanItallie, T.B., Kashiwaya, Y., King, M.T., and Veech, R.L. (2015). A new way to produce hyperketonemia: use of ketone ester in a case of Alzheimer's disease. Alzheimer's & dementia : the journal of the Alzheimer's Association 11, 99-103. 55. Kashiwaya, Y., Bergman, C., Lee, J.H., Wan, R., King, M.T., Mughal, M.R., Okun, E., Clarke, K., Mattson, M.P., and Veech, R.L. (2013). A ketone ester diet exhibits anxiolytic and cognition-sparing properties, and lessens amyloid and tau pathologies in a mouse model of Alzheimer's disease. Neurobiol. Aging 34, 1530-1539. 56. Henderson, S.T., Vogel, J.L., Barr, L.J., Garvin, F., Jones, J.J., and Costantini, L.C. (2009). Study of the ketogenic agent AC-1202 in mild to moderate Alzheimer's disease: a randomized, double-blind, placebo-controlled, multicenter trial. Nutr Metab (Lond) 6, 31. 57. Reger, M.A., Henderson, S.T., Hale, C., Cholerton, B., Baker, L.D., Watson, G.S., Hyde, K., Chapman, D., and Craft, S. (2003). Effects of beta-hydroxybutyrate on cognition in memory-impaired adults. Neurobiol. Aging 25, 311-314. 58. Krikorian, R., Shidler, M.D., Dangelo, K., Couch, S.C., Benoit, S.C., and Clegg, D.J. (2012). Dietary ketosis enhances memory in mild cognitive impairment. Neurobiol. Aging 33, 425 e419-427. 59. Parker, W.D., Jr., Boyson, S.J., and Parks, J.K. (1989). Abnormalities of the electron transport chain in idiopathic Parkinson's disease. Ann. Neurol. 26, 719-723. 60. Polito, C., Berti, V., Ramat, S., Vanzi, E., De Cristofaro, M.T., Pellicano, G., Mungai, F., Marini, P., Formiconi, A.R., Sorbi, S., et al. (2012). Interaction of caudate dopamine depletion and brain metabolic changes with cognitive dysfunction in early Parkinson's disease. Neurobiol. Aging 33, 206 e229-239. 61. Hirsch, E.C., Hunot, S., Damier, P., and Faucheux, B. (1998). Glial cells and inflammation in Parkinson's disease: a role in neurodegeneration? Ann. Neurol. 44, S115-120. 62. Yang, J.R., Liao, C.H., Pang, C.Y., Huang, L.L., Lin, Y.T., Chen, Y.L., Shiue, Y.L., and Chen, L.R. (2010). Directed differentiation into neural lineages and therapeutic potential of porcine embryonic stem cells in rat Parkinson's disease model. Cellular reprogramming 12, 447-461. 63. Vanitallie, T.B., Nonas, C., Di Rocco, A., Boyar, K., Hyams, K., and Heymsfield, S.B. (2005). Treatment of Parkinson disease with diet-induced hyperketonemia: a feasibility study. Neurology 64, 728-30. 64. Mark, L.P., Prost, R.W., Ulmer, J.L., Smith, M.M., Daniels, D.L., Strottmann, J.M., Brown, W.D., and Hacein-Bey, L. (2001). Pictorial Review of Glutamate Excitotoxicity: Fundamental Concepts for Neuroimaging. American Journal of Neuroradiology 22, 1813. 65. Yoshino, A., Hovda, D.A., Kawamata, T., Katayama, Y., and Becker, D.P. (1991). Dynamic changes in local cerebral glucose utilization following cerebral concussion in rats: evidence of a hyper- and subsequent hypometabolic state. Brain Research 561, 106-119. 66. Veech, R.L., Valeri, C.R., and VanItallie, T.B. (2012). The mitochondrial permeability transition pore provides a key to the diagnosis and treatment of traumatic brain injury. Iubmb Life 64, 203-207. 67. Marie, C., Bralet, A.-M., and Bralet, J. (1987). Protective Action of 1,3-Butanediol in Cerebral Ischemia. A Neurologic, Histologic, and Metabolic Study. Journal of Cerebral Blood Flow & Metabolism 7, 794-800. 68. Biros, M.H., and Nordness, R. (1996). Effects of chemical pretreatment on posttraumatic cortical edema in the rat. Am. J. Emerg. Med. 14, 27-32. 69. Massieu, L., Haces, M.L., Montiel, T., and Hernandez-Fonseca, K. (2003). Acetoacetate protects hippocampal neurons against glutamate-mediated neuronal damage during glycolysis inhibition. Neuroscience 120, 365-378. 70. Prins, M.L., Lee, S.M., Fujima, L.S., and Hovda, D.A. (2004). Increased cerebral uptake and oxidation of exogenous betaHB improves ATP following traumatic brain injury in adult rats. J Neurochem 90, 666-672. 71. Song, L., Pei, L., Yao, S., Wu, Y., and Shang, Y. (2017). NLRP3 Inflammasome in Neurological Diseases, from Functions to Therapies. Front. Cell. Neurosci. 11, 63. 72. Ari, C., Kovács, Z., Juhasz, G., Murdun, C., Goldhagen, C.R., Koutnik, A.P., Poff, A.M., Kesl, S.L., and D’Agostino, D.P. (2016). Exogenous Ketone Supplements Reduce Anxiety-Related Behavior in Sprague-Dawley and Wistar Albino Glaxo/Rijswijk Rats. Front. Mol. Neurosci. 9, 137. 73. Chen, L., Miao, Z., and Xu, X. (2017). beta-hydroxybutyrate alleviates depressive behaviors in mice possibly by increasing the histone3-lysine9-beta-hydroxybutyrylation. Biochem Biophys Res Commun 490, 117-122. 74. Strahlman, R.S. (2006). Can Ketosis Help Migraine Sufferers? A Case Report. Headache: The Journal of Head and Face Pain 46, 182-182. 75. Schnabel, T.G. (1928). AN experience with a ketogenic dietary in migraine*. Ann. Intern. Med. 2, 341-347. 76. Di Lorenzo, C., Currà, A., Sirianni, G., Coppola, G., Bracaglia, M., Cardillo, A., De Nardis, L., and Pierelli, F. (2013). Diet transiently improves migraine in two twin sisters: possible role of ketogenesis? Funct. Neurol. 28, 305-308. 77. Di Lorenzo, C., Coppola, G., Sirianni, G., Di Lorenzo, G., Bracaglia, M., Di Lenola, D., Siracusano, A., Rossi, P., and Pierelli, F. (2015). Migraine improvement during short lasting ketogenesis: a proof-of-concept study. Eur. J. Neurol. 22, 170-177. 78. Evangeliou, A., Vlachonikolis, I., Mihailidou, H., Spilioti, M., Skarpalezou, A., Makaronas, N., Prokopiou, A., Christodoulou, P., Liapi-Adamidou, G., Helidonis, E., et al. (2003). Application of a ketogenic diet in children with autistic behavior: pilot study. J Child Neurol 18, 113-118. 79. Herbert, M.R., and Buckley, J.A. (2013). Autism and dietary therapy: case report and review of the literature. J Child Neurol 28, 975-982. 80. Dyson, P.A., Beatty, S., and Matthews, D.R. (2007). A low-carbohydrate diet is more effective in reducing body weight than healthy eating in both diabetic and non-diabetic subjects. Diabet. Med. 24, 1430-1435. 81. Cole, M.A., Murray, A.J., Cochlin, L.E., Heather, L.C., McAleese, S., Knight, N.S., Sutton, E., Abd Jamil, A., Parassol, N., and Clarke, K. (2011). A high fat diet increases mitochondrial fatty acid oxidation and uncoupling to decrease efficiency in rat heart. Basic Res Cardiol 106, 447-457. 82. Veldhorst, M., Smeets, A., Soenen, S., Hochstenbach-Waelen, A., Hursel, R., Diepvens, K., Lejeune, M., Luscombe-Marsh, N., and Westerterp-Plantenga, M. (2008). Protein-induced satiety: effects and mechanisms of different proteins. Physiol. Behav. 94, 300-307. 83. Fine, E.J., and Feinman, R.D. (2004). Thermodynamics of weight loss diets. Nutr Metab (Lond) 1, 15. 84. Arase, K., Fisler, J.S., Shargill, N.S., York, D.A., and Bray, G.A. (1988). 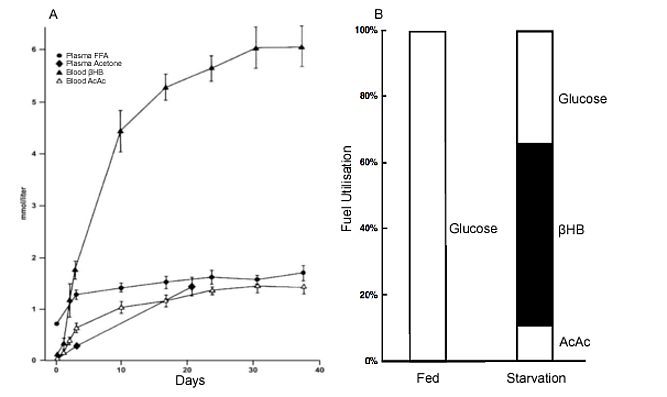 Intracerebroventricular infusions of 3-OHB and insulin in a rat model of dietary obesity. Am J Physiol 255, R974-981. 85. Carneiro, L., Geller, S., Fioramonti, X., Hébert, A., Repond, C., Leloup, C., and Pellerin, L. (2016). Evidence for hypothalamic ketone body sensing: Impact on food intake and peripheral metabolic responses in mice. American Journal of Physiology - Endocrinology and Metabolism 310, E103-E115. 86. Laeger, T., Pöhland, R., Metges, C.C., and Kuhla, B. (2012). The ketone body β-hydroxybutyric acid influences agouti-related peptide expression via AMP-activated protein kinase in hypothalamic GT1-7 cells. Journal of Endocrinology 213, 193-203. 87. Gibson, A.A., Seimon, R.V., Lee, C.M., Ayre, J., Franklin, J., Markovic, T.P., Caterson, I.D., and Sainsbury, A. (2015). Do ketogenic diets really suppress appetite? A systematic review and meta-analysis. Obes. Rev. 16, 64-76. 88. Stubbs BJ, Cox PJ, Evans RD, Cyranka M, Clarke K, De wet H. A Ketone Ester Drink Lowers Human Ghrelin and Appetite. Obesity (Silver Spring). 2018;26(2):269-273. 89. Sumithran, P., Prendergast, L. A., Delbridge, E., Purcell, K., Shulkes, A., Kriketos, A., & Proietto, J. (2013). Ketosis and appetite-mediating nutrients and hormones after weight loss. Eur J Clin Nutr, 67(7), 759-764. 90. Hanahan, D., and Weinberg, R.A. (2011). Hallmarks of cancer: the next generation. Cell 144, 646-674. 91. Warburg, O. (1956). On the origin of cancer cells. Science 123. 92. Seyfried, T.N. (2015). Cancer as a mitochondrial metabolic disease. Frontiers in Cell and Developmental Biology 3, 43. 93. Groves, A.M., Win, T., Haim, S.B., and Ell, P.J. (2007). Non-[18F]FDG PET in clinical oncology. Lancet Oncol. 8, 822-830. 94. Colman, R.J., Anderson, R.M., Johnson, S.C., Kastman, E.K., Kosmatka, K.J., Beasley, T.M., Allison, D.B., Cruzen, C., Simmons, H.A., Kemnitz, J.W., et al. (2009). Caloric restriction delays disease onset and mortality in rhesus monkeys. Science (New York, N.Y.) 325, 201-204. 95. Lee, C., Raffaghello, L., Brandhorst, S., Safdie, F.M., Bianchi, G., Martin-Montalvo, A., Pistoia, V., Wei, M., Hwang, S., Merlino, A., et al. (2012). Fasting cycles retard growth of tumors and sensitize a range of cancer cell types to chemotherapy. Sci. Transl. Med. 4, 124ra127. 96. Nebeling, L.C., Miraldi, F., Shurin, S.B., and Lerner, E. (1995). Effects of a ketogenic diet on tumor metabolism and nutritional status in pediatric oncology patients: two case reports. J. Am. Coll. Nutr. 14. 97. Fine, E.J., Segal-Isaacson, C.J., Feinman, R.D., Herszkopf, S., Romano, M.C., Tomuta, N., Bontempo, A.F., Negassa, A., and Sparano, J.A. (2012). Targeting insulin inhibition as a metabolic therapy in advanced cancer: A pilot safety and feasibility dietary trial in 10 patients. Nutrition 28, 1028-1035. 98. Zuccoli, G., Marcello, N., Pisanello, A., Servadei, F., Vaccaro, S., Mukherjee, P., and Seyfried, T.N. (2010). Metabolic management of glioblastoma multiforme using standard therapy together with a restricted ketogenic diet: Case Report. Nutr Metab (Lond) 7, 33. 99. Klement, R. J. (2017). "Beneficial effects of ketogenic diets for cancer patients: A realist review with focus on evidence and confirmation." Med Oncol 34(8): 132. 100. Poff, A.M., Ari, C., Arnold, P., Seyfried, T.N., and D'Agostino, D.P. (2014). Ketone supplementation decreases tumor cell viability and prolongs survival of mice with metastatic cancer. Int. J. Cancer 135, 1711-1720. 101. Feinman, R.D., Pogozelski, W.K., Astrup, A., Bernstein, R.K., Fine, E.J., Westman, E.C., Accurso, A., Frassetto, L., Gower, B.A., McFarlane, S.I., et al. (2015). Dietary carbohydrate restriction as the first approach in diabetes management: critical review and evidence base. Nutrition 31, 1-13. 102. Gannon, M.C., and Nuttall, F.Q. (2004). Effect of a high-protein, low-carbohydrate diet on blood glucose control in people with type 2 diabetes. Diabetes 53. 103. Hussain, T.A., Mathew, T.C., Dashti, A.A., Asfar, S., Al-Zaid, N., and Dashti, H.M. (2012). Effect of low-calorie versus low-carbohydrate ketogenic diet in type 2 diabetes. Nutrition 28. 104. Boden, G., Sargrad, K., Homko, C., Mozzoli, M., and Stein, T.P. (2005). Effect of a low-carbohydrate diet on appetite, blood glucose levels, and insulin resistance in obese patients with type 2 diabetes. Ann. Intern. Med. 142. 105. Noakes, M., Foster, P.R., Keogh, J.B., James, A.P., Mamo, J.C., and Clifton, P.M. (2006). Comparison of isocaloric very low carbohydrate/high saturated fat and high carbohydrate/low saturated fat diets on body composition and cardiovascular risk. Nutr Metab (Lond) 3, 7. 106. Mikkelsen, K.H., Seifert, T., Secher, N.H., Grondal, T., and van Hall, G. (2015). Systemic, cerebral and skeletal muscle ketone body and energy metabolism during acute hyper-D-beta-hydroxybutyratemia in post-absorptive healthy males. J. Clin. Endocrinol. Metab. 100, 636-643. 107. Kesl, S.L., Poff, A.M., Ward, N.P., Fiorelli, T.N., Ari, C., Van Putten, A.J., Sherwood, J.W., Arnold, P., and D’Agostino, D.P. (2016). Effects of exogenous ketone supplementation on blood ketone, glucose, triglyceride, and lipoprotein levels in Sprague–Dawley rats. Nutr. Metab. 13, 9. 108. Srivastava, S., Kashiwaya, Y., King, M.T., Baxa, U., Tam, J., and Niu, G. (2012). Mitochondrial biogenesis and increased uncoupling protein 1 in brown adipose tissue of mice fed a ketone ester diet. FASEB J. 26. 109. Lemieux, I., Lamarche, B., Couillard, C., Pascot, A., Cantin, B., Bergeron, J., Dagenais, G.R., and Despres, J.P. (2001). Total cholesterol/HDL cholesterol ratio vs LDL cholesterol/HDL cholesterol ratio as indices of ischemic heart disease risk in men: the Quebec Cardiovascular Study. Arch. Intern. Med. 161, 2685-2692. 110. Westman, E.C., Yancy, W.S., Edman, J.S., Tomlin, K.F., and Perkins, C.E. (2002). Effect of six-month adherence to a very-low-carbohydrate diet program. Am J Med 113. 111. Hokanson, J.E., and Austin, M.A. (1996). Plasma triglyceride level is a risk factor for cardiovascular disease independent of high-density lipoprotein cholesterol level: a meta-analysis of population-based prospective studies. J. Cardiovasc. Risk 3, 213-219. 112. Samaha, F.F., Iqbal, N., Seshadri, P., Chicano, K.L., Daily, D.A., McGrory, J., Williams, T., Williams, M., Gracely, E.J., and Stern, L. (2003). A Low-Carbohydrate as Compared with a Low-Fat Diet in Severe Obesity. New Engl J Med 348, 2074-2081. 113. Kasper, H., Thiel, H., and Ehl, M. (1973). Response of body weight to a low carbohydrate, high fat diet in normal and obese subjects. Am J Clin Nutr 26, 197-204. 114. Kemper, M.F., Srivastava, S., Todd King, M., Clarke, K., Veech, R.L., and Pawlosky, R.J. (2015). An Ester of beta-Hydroxybutyrate Regulates Cholesterol Biosynthesis in Rats and a Cholesterol Biomarker in Humans. Lipids 50, 1185-1193.